Raccoon skull covered in mental health documents. $50 This particular one sold but I can make another one just like it. I ship within the United States. Check out my facebook page for more photos of skulls I have done. Ink Prints on Vintage Documents by Me…..
A variety of ink prints on vintage / antique documentation by me. Enjoy! Just click on the piece you like to see larger image & more details. 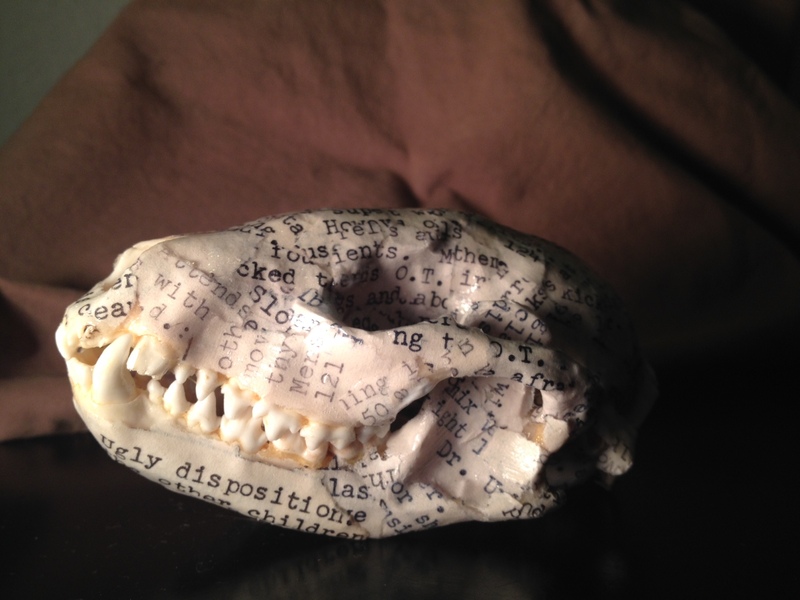 Raccoon Skull & Antique Documents – By Me….. This is a real raccoon skull, fully intact and fully covered in documents from an abandoned institution called Letchworth Village in New York. This took me 7 hours to complete & measures 5 x 3 Inches. This is a great conversation piece. There are so many words wrapped all over the skull from one patient’s file. The patient’s name was “Rose Marie” and she was from Brooklyn, NY. These files are from the 1940s-1960s. I put her files into a lot of my work. Collage on canvas using vintage / antique documents from abandoned Psychiatric facilities. **Be sure to follow me on Twitter for artwork giveaways throughout the year!